The Friabimat SA-400 was originally designed as a method to effectively determine the friability of hard pellets and granules prior to further processing, for example, drum coating under precisely defined, controlled and reproducible conditions. 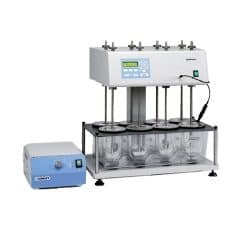 The instrument is particularly useful in detecting variations in mechanical properties between different formulations and batches and is a convenient tool in both research and development and quality control applications. 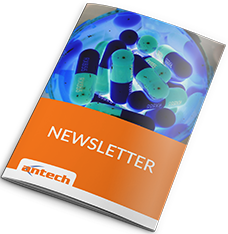 The instrument has now been included in the 8th edition of the European Pharmacopoeia under Chapter No. 2.9.41 Friability of Granules and Spheroids. The Friabimat was originally designed as a method to effectively determine the friability of hard pellets and granules prior to further processing, for example, drum coating under precisely defined, controlled and reproducible conditions. 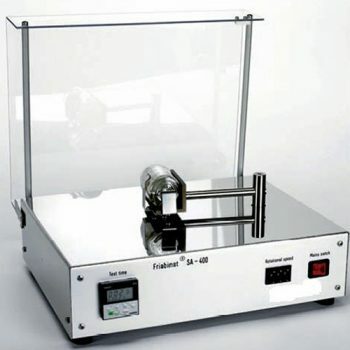 The instrument is particularly useful in detecting variations in mechanical properties between different formulations and batches and is a convenient tool in both research and development and quality control applications. Following review, the instrument has now been included in the 8th edition of the European Pharmacopoeia under Chapter No. 2.9.41 Friability of Granules and Spheroids. This describes the Friabimat under Method B Oscillating Apparatus 2.9.41.-2. 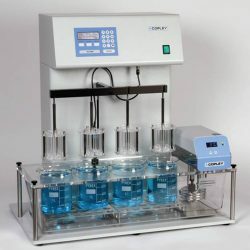 The Friabimat’s range of application has since been extended to include hard coated and uncoated tablets and other dosage forms which fall outside the scope of the standard friability tester. For the purpose of the test, the sample to be tested is confined within a standard 105 ml glass bottle (measuring approx. 85 mm high x 49 mm i.d. 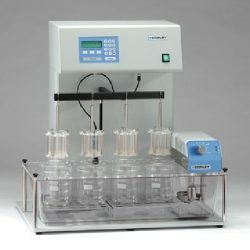 with twist-off cap) which serves as the sample container. During operation, this sample container is secured by means of a spring clip to the sample container holder horizontally mounted on the end of an oscillating arm having an arc of 37 degrees at a radius of 152 mm from the centre of oscillation. 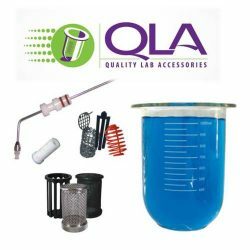 The abrasive action is generated by the horizontal shaking movement of the oscillating arm which causes the samples to rub against and collide with each other and/or the internal surfaces of the sample container. 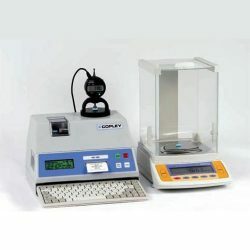 The intensity of the abrasive action and the duration of the test can be adjusted via the controls mounted on the front panel between 0 and 400 oscillations per minute and 0 and 9999 seconds respectively. 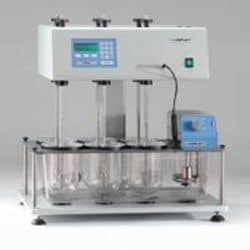 This enables the user to optimise the test conditions the test conditions applicable to each formulation and reproduce it at will. Average test times are between 2 and 4 minutes. The combination of these short test run times together with the use of inexpensive, commercially available glass bottles as the sample container means that it is possible to carry out tests economically in batches as opposed to singularly on an infrequent basis. The Friabimat measures 440 x 300 x 220 mm and weighs 13 kilos. Adjust the number of oscillations to the desired frequency by adjusting the thumb wheel switches on the rotary speed adjuster mounted on the front panel to the appropriate setting (between 0 and 400 oscillations per minute). Now set the test duration using the push button timer (between 0 and 9999 seconds). Note: Shake for about 240 seconds at approx. 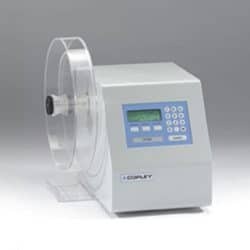 400 oscillations per minute for hard dose forms, or, for example, 120 seconds at 140 oscillations per minute for soft dose forms. Optimise these settings according to the dosage form concerned. The Friabimat is now ready for operation. Take a sample of the formulation to be tested and remove any fine particles present in the sample using a 355 micron sieve. Weigh out approx. 10 grams (m1) of the product into a sample container ensuring that the twist off cap is well secured. Now place the sample container into the spring clip fastening on the Friabimat provided to secure it and close the safety lid. Start the test by pressing the appropriate key on the timer. The unit will switch off automatically on expiration of the preset time. The time remaining to the end of the test is displayed on the timer duringoperation. Note: The Friabimat is fitted with a safety interlock which automatically pause operation if the safety cover is opened during atest. The test can be re-started once again by simply closing the lid.At the end of the test, sieve as at the start of the test and re-weigh (m2). Perform three tests and calculate the mean value. Express the results in terms of % weight loss using the formula (m1-m2) x 100 divided by m1.